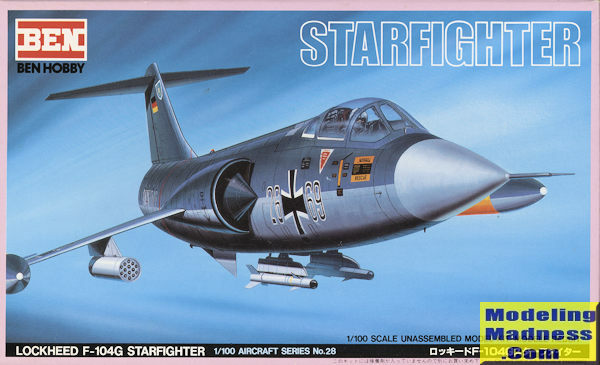 Surprisingly, the F-104 has been boxed in this scale by a rather large number of companies including Heller, Starfix, Faller, Revell, Takara, UPC and Tamiya in addition to Ben. In the past Ben has reboxed Tamiya kits and it may be that this is from that source, though it also could be Takara. I am sure someone knows for sure, but I do not. Regardless, the kit is actually quite nice. There is engraved panel line detail and the shape seems to be about right. There is no cockpit, though a pilot in a seat shape is provided, which is about standard for the time period. 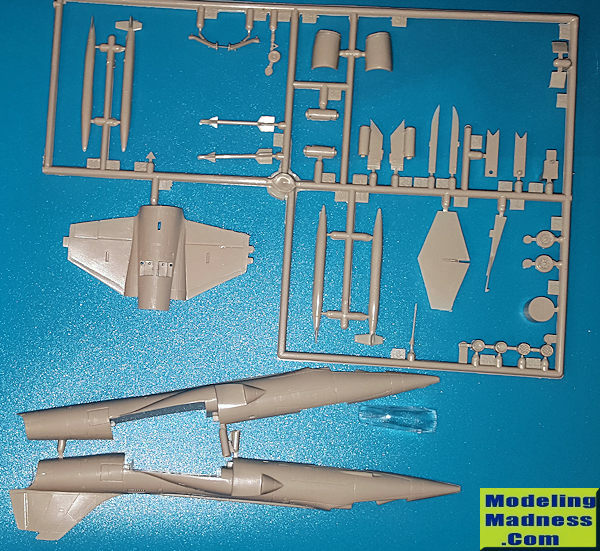 The wing is a single piece as it is on most Starfighter kits of any scale and in this case the two wings are molded with the lower fuselage/main gear wells. There is a separate nose gear well that incorporates the gear doors. Main doors ae separate. The main gear are in right and left sides with separate wheels while the nose gear incorporates the nose wheel. Main gear doors are provided. The gear can be modeled for in flight display, though there is no stand provided. Engine intake sides are separate and the intakes are shallow, but this is not an issue with the 104 as the opening is quite small. A separate burner can and one-piece tailplane are provided. Wing tip tanks are in upper and lower halves and for weapons you get rocket pods molded in with the wing pylons as well as f uselage pylons and a pair of Sidewinder shapes. On the ventral strake, the tail hook is molded in place. Instructions are well done and in several languages. There are markings for two planes. One is a German plane with MFG 2 in dark grey over silver and the other with 323 Squadron, Dutch Air Force in dark green/grey over sky grey. The decals are a bit thick but are nicely printed. How effective they are nearly 30 years later is unknown, but I don't think you will have any aftermarket options in this regard. The paint chart uses Tamiya paint which only enhances my suspicions that this is the Tamiya kit reboxed. 1/100 scale is actually quite popular and one where the modeler can really find quite a few kits. I won this one in a raffle, but have seen them for sale at various venues. If you don't have the space of anything large, or just want something a tad different, this would be an excellent choice.